Teacher Ollie traveled in Taiwan for two weeks as a hitchhiker, he wrote the destination on the cardboard and wait to hitchhike near the interchange. 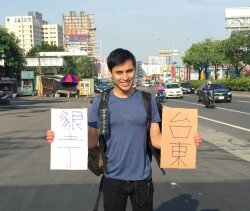 Because of Taiwanese's warmth and kindness,Teacher Ollie hitchhiked successfully in Taiwan for seven minutes in average, which was the fastest record in his expereicne. We wish he enjoy his special and unforgettable journey in Taiwan!